Saturday, April 8th is the #EdCollabGathering, an free online conference addressing innovative ideas in education. The Educator Collaborative, LLC, is a think tank and educational consulting organization working to innovate the ways educators learn together. I will be presenting, “How do the choices we make impact the world? Blending Science and English in an Investigative Writing Unit of Study.” The presentation will address inquiry based content area writing with investigative science research and feature articles. Grounded in informational text and research, students write their own science based investigative journalism article with the guiding question: How do the choices we make impact the world? Below are the slides for the presentation. Check out an archive of the presentation here. Last night I had the amazing opportunity to go behind the scenes of the American Museum of Natural History in New York City. It was early evening and the museum was closed to the public. My tour guide was a writer for the museum and she talked about finding the stories in exhibits. Today, a writer’s job is not just to list the facts. Rather, people are drawn to stories and personal connections. The details presented on the exhibit walls are snippets of stories about our history, our world, our environment. The museum has more than 33 million artifacts and specimens in its collection and only a fraction are on view for the public. To learn more about some of the amazing stories about the artifacts behind the scenes of the museum, you can visit the AMNH blog Shelf Life which offers videos detailing the rarely seen items in the American Museum of Natural History. My favorite episode so far is Episode Eight: The Voyage of a Giant Squid which describes how a giant frozen squid was transported from New Zealand to the United States. To get the giant squid through customs, it had to be identified as frozen seafood and sushi in order to be brought to the museum for research purposes. The references to giant squids in mythology and classical literature like Jules Verne’s 20 Thousand Leagues Under the Sea are brought to life when we see an actual giant squid or gargantuan size exhibit at the museums and listen to the tales told by scientists and paleontologists. The museum also has an App that offers snippets of stories and backstories to the museum’s more famous items on display. To view the giant whale being cleaned or to learn how the giant sequoia tree was brought inside the museum, the app offers more photos and videos to the questions you want to know more about. Whether you live near New York City or are on the other side of the country, the American Museum of Natural History has resources available to ALL teachers and students with curious minds on it’s website. There are curriculum materials, online seminars, and professional development material connecting with the Common Core Standards that any teacher can access to learn more and to discover fascinating stories to share with our students about our world past and present. I have just returned from a week long vacation in San Francisco with my family. The benefits of my children having a teacher for a mother is that our vacation will be a fun filled adventure filled with discovery, wonder, and learning. Hence, our trip to the west coast included jam packed days for exploration and inquire about the world. Below are the places that we visited and the array of resources that all teachers and parents can utilize online or in person that encourages science inquiry and an interest in American history. Muir Woods – Muir Woods National Monument is a sanctuary of Redwoods and ecological treasure. 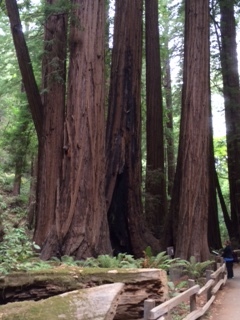 The ginormous trees are breath taking with the tallest tree is Muir Woods over 250 feet. Some of these trees are over 1,000 years old. This destination offers scientific facts about the California Redwoods, the role of Fog and Fire, the anatomy of the trees, and the history of the National Parks Service that protects this forest. 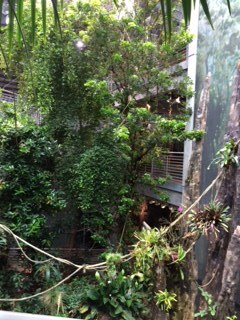 California Academy of Sciences – This Museum in Golden Gate Park is an aquarium, planetarium, and natural history museum. With hands on exhibits and virtual programs, the museum promotes science in both theory and everyday experiences. There is a host of programs and curriculum available online for educators. de Young Museum of Fine Arts – Another great museum in Golden Gate Park, this art museum boasts a collection of Modern Art from around the world. The Marcus Garden of Enchantment is playful and mysterious and encourages people to explore its different pathways, structures, artworks, and natural features. Don’t forget to take the elevator to the top of the tower for a 360 degree view of all of San Francisco if you visit the museum. Online you can find an abundance of curriculum resources for educators covering teaching guides and lessons. 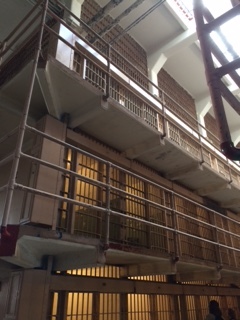 Alcatraz – My 10 year old son would tell you that this was the best part of the vacation, visiting the island and listening to the stories of those who experienced Alcatraz as guards, inmates, and families. Alcatraz has a broad history from first being established as a fort during the civil war, a prison from 1859-1963, occupied to make a political statement for Native Americans, and now an ecological preserve. It is amazing to go inside the prison and hear stories from an array of people who worked there before it closed as a prison. There was also a unique exhibit on the island titled “Portraits of Resilience: Children of Incarcerated Parents” that brings to the forefront the impact of incarceration on families today. The NAACP reports that there are more than 2 million people in prisons. Criminal justice is a critical topic in education that plays a role in teaching history and literature. Books like Jason Reynold’s The Boy in the Black Suit and Wes Moore’s The Other Wes Moore paint a different picture from the Al Capone Does my Shirts by Gennifer Choldenko. Whereas the image of the gangster in the 1920s brought a romanticized picture of outlaws, over crowding in jails and racial bias in our prisons today offer a very different image worth exploring. 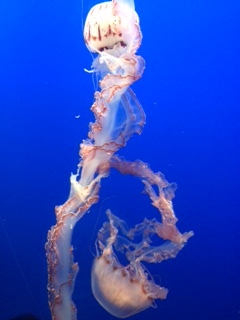 Monterey Bay Aquarium – I know so many people who wanted to be marine scientists when they were younger. Monterey Bay Aquarium would be a dream job for many. Where else can you see so many differently kinds of Jelly Fish or Sea Stars in one place? This aquarium is an amazing center that specializes in researching and educating about marine life in order to co exist and sustain our oceans. The educator’s tab on the website offers an abundance of curriculum materials for all grade levels addressing current exhibits. All around us are amazing cultural centers that promote learning, science, history, and an appreciation for nature around us. You do not have to take a trip to San Francisco to experience all the great resources that abound the city. Online one can take virtual field trips and peek into an ant colony, swim with the sea otters, or be inspired to write a poem about the beauty of the photographs of national landmarks. Whether you have children or students obsessed with anything that moves (i.e. trains and buses), teach about the turn of the 20th Century, or are looking for an awesome museum that is off the beaten path . . . The New York Transit Museum in Brooklyn, New York is the place to go. My family and I spent the afternoon exploring throughout this hands-on museum learning about history of the New York City Transit from omnibus to elevated trains to trolleys to the subway. Did you know that the IRT (Interborough Rapid Transit System) began constructing the first subway line in 1900 and in 1904 the first subway line carried as many as 100,000 people on its very first day! Most of the subway system that is in place today was built from 1916 to 1931. Today, New York City subway lines are one of the most extensive and busiest in the world. But the museum is not all history, there were science connections with an exhibition on Electricity. From a math standpoint, there is also an exhibition about the tokens. At one time, it only cost a dime to ride the subway! For a music connection, Michael Jackson’s “Bad” video was filled just a few blocks in a nearby subway station twenty five years ago. Hands down, the best part of museum happens to be the vintage subway cars. The lower level includes more than a dozen subway cars from the Brooklyn Union Elevated Car, to the Money Train and more. The museum’s website offers the history of the transit system, lesson plans for teachers, and historical documents on the teacher resources webpage. Additional online activities include Gallery talks, magnetic transit poetry, and transit artifacts . The museum is available for school trips and open to the public Tuesdays through Sundays.